It’s true what they say – you are what you eat. And glowing, radiant skin is a sign of good health and wellbeing. “To achieve radiant skin, as a general rule, it is advisable to avoid foods that will spike your blood sugar levels,” explains Uxshely Chotai from The Food Psychology Clinic (www.thefoodpsychologyclinic.co.uk). “Keeping your blood sugar levels constant is a great way to ensure that you skin stays in the best possible condition. This means that sweet treats and refined carbohydrates are definitely ruled out if you are looking to keep your skin as radiant as possible.” It’s not all bad news though, as certain foods are highly beneficial to your complexion and should be added to our plates on a regular basis. Here we take a look at some of the best skin foods. 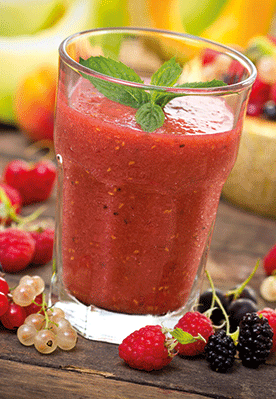 Try this skin-friendly smoothie, devised by nutritionist Rick Hay. Add all the ingredients to a blender and blend till smooth. Pour into a glass and enjoy!